The Countryside of Hospitaller Rhodes 1306-1423 explores the main themes of settlement, population and defence of the island of Rhodes from 1306 through to 1423, approximately halfway through the period of Hospitaller rule. Based largely on the Hospital’s Rhodian archive, this book is the scientific presentation of 208 documents brought together with detailed English summaries to further help readers understand the documents and their technical features. While the majority of research into this subject has previously been focused on the town of Rhodes, this book concentrates instead on the late-medieval countryside, providing a new angle from which to view this complex period. Through a corpus of Hospitaller texts, it presents many aspects of the Hospitaller Order’s history as well as exploring other crucial developments in the period. 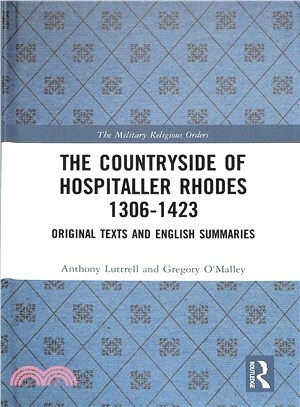 Including both a discussion of Cristoforo Buondelmonti’s description of Rhodes, and a section dedicated to the sources used within this work, The Countryside of Hospitaller Rhodes is ideal for academics and postgraduates of the Crusades.